Read on for the full news story. Edward Teach, better known as Blackbeard, is perhaps the most famous of all pirates. This cunning character was a master of presenting a fearsome appearance to shake the resolve of his enemies. At the height of his infamy, Blackbeard was so well-known, so feared, that many of his targets would surrender at the mere sight of him! 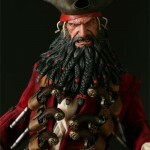 Our figure of the legendary Blackbeard features approximately 27 points of articulation. Figure comes with four pistols, rifle, and sword. Also included in our Pirate 3-Pack are two more legendary pirate figures from Assassin’s Creed IV: Black Flag. We don’t want to reveal who they are until they’ve been given a proper introduction by Assassin’s Creed developer Ubisoft, but we’re sure that you’ll recognize both of these notorious characters once they’re revealed! 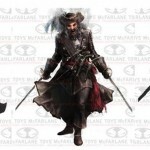 Each of our infamous pirate figures features the same game accuracy and attention to detail as Blackbeard, and each includes the same level of articulation and range of accessories as our other Assassin’s Creed figures. Look for more information about these figures in the months leading up to the release of Assassin’s Creed IV: Black Flag! Read on for the pic. History reports Edward Teach, AKA Blackbeard, met his demise in 1718. Now, nearly 300 years later, Sideshow Collectibles breathes life into this terrifying historical icon with an intricately detailed Premiun Format Figure. 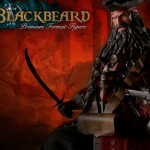 Stay tuned in the coming weeks as SideShow reveals the Ultimate Blackbeard collectible.